Well, I can’t call it a stack. 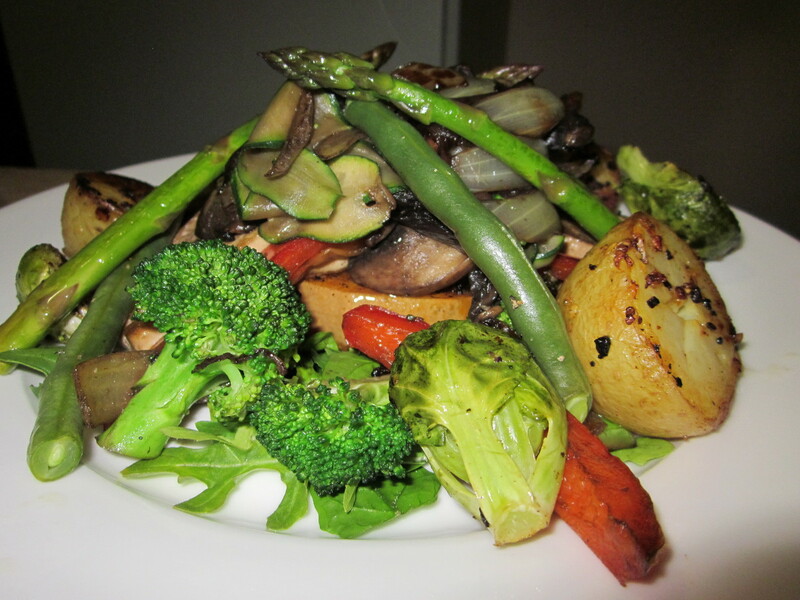 Mmmmm tofu, marinated and pan-fried, then topped with an array of vegies. It’s so good. The most important part of this is making sure your tofu is well marinated – I suggest at least 24 hours. I rarely plan meals that far ahead, so when I find my thoughts turning to tofu, I thickly slice some hard tofu, pop in the marinade and then keep it in the fridge, ready for me to use when the urge strikes. Then it’s ready to have for tofu burgers, stir frys, or in this case a tofu vegie pile. My favourite marinade at the moment is Braggs (click on the link if you don’t know what it is ), garlic and chilli in water. You could use soy sauce instead, but I think Braggs has a better flavour. For the pile, I roasted some rounds of butternut pumpkin (whole rounds just sliced off the pumpkin, skin included), potato, brussels sprouts, asparagus and green beans. Plus pan-fried tofu, mushroom, onion, capsicum, zucchini strips and very lightly cooked broccoli. On a bed of salad greens I placed the pumpkin, put the tofu on top of that and then piled on the rest of the vegies, topping it off with the asparagus and green beans. Thinking about it makes me want it again!